No check in instructions were sent to me this time but we had stayed there in March so I knew the drill. The condo code was sent but during our last stay, my daughter had to contact your team members to get it. The Captain's Suite is very comfortable. It is best suited for 4 people but can handle up to 6. Parking is available and the location is great, right in the middle of Canal Park. It is within walking distance of everything you need. The team at Cascade is excellent! As previously stated, my experience was informative, accurate, personable, and I will highly recommend you - I actually already have! 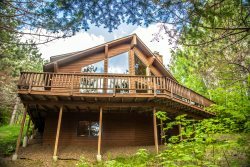 This property was a very beautiful accommodation with a spectacular view of Duluth. The beds were very comfortable, all rooms were very large, and it was extremely helpful to have two bathrooms. The location was the icing on the cake - we had access, within walking distance, for almost everything we wanted to explore during the weekend! The property was super close to the water and shopping. The condo was perfect - it was clean and comfortable. The beds were super soft and comfy making for a great nights sleep. I was sad to leave but will be back for sure! The house was perfect for our family. We had 4 adults and 2 children. The bedrooms were spacious and we loved having the extra living space. We made all our meals in the kitchen and it had everything we needed. The location was excellent. We walked everywhere we went. It was nice to have the private parking spot and we didn't have any problem with parking for our other vehicle. Perfect location! Property was well appointed, and accommodated 5 of us quite well (we rearranged the sofa sleeper so we didn't have to put it away every day). The front desk allowed us to use the laundry. The parking space was very convenient. We did realize that you could t have all of the lights on in the master while using the blow dryer - we popped the circuit a couple of times. Even with that we would return gladly! Our favorite restaurants in Canal Park were Lake Avenue and the Smokehaus. The condo was truly sensational. We had stayed at the same condo last summer for the same period of time and truly loved our experience. The location is incredible, in walking distance of absolutely everything you need - beach, restaurants, downtown Duluth and cinema, to mention but a few. The location was the first draw, but quite frankly, the condo is pretty perfect too. We love that there were speakers all around the apartment, as that allowed us to relax with one another with some music in the background. The TV and cable options were also great. We made use of the kitchen 2 nights out of the 3 and it was the perfect size for what we needed. I'm hoping that we can come back again next summer too! Very nice place to stay in Duluth. It is in the middle of a busy hotel but the condo itself is quite and on the corner of the building. Nicely decorated with quality furnishings and great city views. Anyone who has had to park a vehicle in canal park will greatly appreciate the private parking space. We will stay here again!